Very underrated rogue weapon, the tempo gain it can give you is amazing. Is this card really underrated, or just bad? It's like a weapon SI-7. 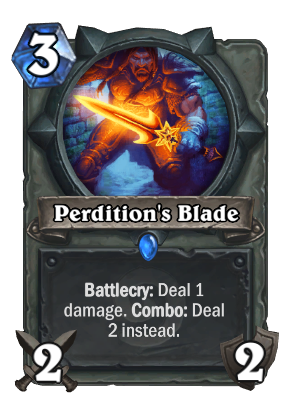 The card has the advantage of bypassing taunt minons something Assassin's Blade can't do and Death's Bite (like all expansion cards) eventually rotated out of standard. Both of which either have or will rotate out of standard. As an Expert card this will never rotate out of standard and anything that effects battlecries (that is not exclusive to minons) also effects this card. Is the damage random on this card when played? Player I was against used it with 2 health left and killed themselves. I've done basically that in arena. The way you play it is by dragging it to whatever you want to do damage to. So if you don't think about it and naturally drag weapons on top of your hero to play them, the game assumes you want to deal 2 damage to yourself. Keeps shooting my own character....grrr.